1 – Another succesful photo shoot! Sunday, I had the honor of taking pictures of this sweet girl and her family. To see more pictures, head on over to sg.photography. 2 – My little man is getting so big. He loves to brush his teeth. As soon as he sees the toothbrush, he gets all excited. He does a pretty good job too. He would sit and brush his teeth for hours (not that that’s a bad thing). 3 – I don’t know why I open my big mouth sometimes. My sister wanted to make cupcakes for my niece’s birthday party instead of buying them (they get pretty expensive). I told her that I had the tip to make grass and could do them for her. It’s not that they were hard to do (once I got into a rhythm), it was just time consuming. But I have to admit, they do look pretty darn good. I was so sad to see the kids dive into them and destroy all my work! 4 – I love the outlet (who doesn’t, right?)! E needs a ton of fall clothes. He had nothing before we went. We didn’t get much but I was able to score last year’s long sleeve t-shirts from Carters for only $1.99. Not too shabby. The outlets are so close to our house, it’s dangerous. I could go there every week. But I do practice some restraint….I only go every other week! 5 – I had been craving a nice, hot, soft pretzel for the longest time. 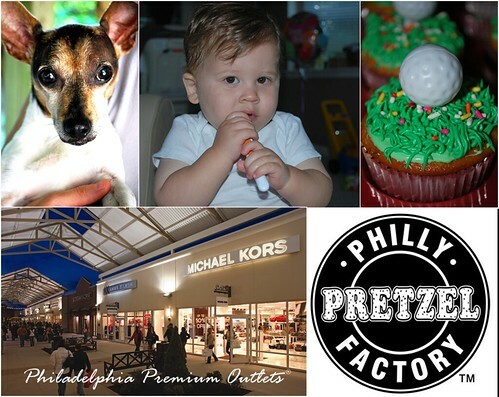 And there’s only one place to get a good one: The Philadelphia Pretzel Factory (that is, if you aren’t in the city). I stopped there on Tuesday for lunch. And it just so happened to be Dollar Dog Day! I love the pretzel dog. It’s such a genius concept. You had a fun week! I'm thinking I'd love those pretzels. I live near the outlets, too. But I hate to shop. Totally wasted on me. We used to live near an outlet mall — I miss it! Glad you scored some good deals. Those cup cakes are cute! Great job! I visited your photography site. Awesome pictures! You did great! Great job on the cupcakes. It is very time consuming to decorate them, but they can be so cute! I've heard of the Philadephia Pretzel Factory. Yum! Your pics are great. Had to smile at the one where they are growling at each other. LOL. Your son is just the cutest little thing. And he LIKES to brush his teeth? Wow. Enjoy that while you can. The cupcake could undo all his hard work though. Ha. Cute blog and Great pictures! The cupcakes look great – I would dive into them too. Your son looks so cute. My boy enjoys brushing his teeth too!